Make sure you start off your meal on the right bite. Maryland’s renowned restaurants, from Ocean City to Oxford, are plating up some formidable appetizers. Whether it’s local crab mac and cheese or stuffed jalapenos, there’s something for every palate at these awesome places for apps in Maryland. For the last 25 years, St. Michael’s Crab and Steakhouse in St. Michael’s has provided exquisite Maryland crab dishes. Enjoy waterfront seating at this historic location while chowing down on their crab mac and cheese appetizer. Macky’s Bayside Bar and Grill is a family-friendly, lively spot in Ocean City. Come in for lunch, dinner, or the nightlife during the summer season. All of the appetizers are great, but the scallop’s dynamite is a standout. One of Baltimore’s premier Afghan restaurants, The Helmand has offered authentic middle eastern cuisine for the last two decades. Diners would be remiss not to order the Kaddo Borawni, a tenderly baked and pan-fried baby pumpkin season with sugar and served atop a yogurt garlic sauce. Osteria 177 prides itself on its authentic Italian cuisine. 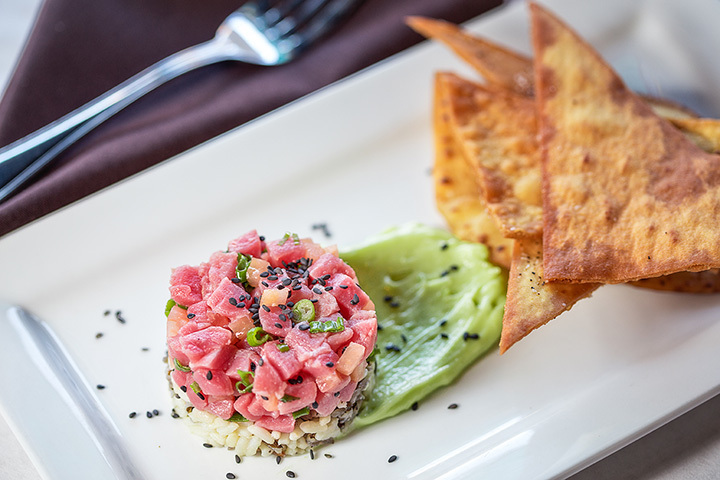 They describe their cuisine as a “gastronomical delight, the culmination of the finest ingredients from sushi-grade ahi carpaccio to Fell’s Point Beef,” and we have to agree. Start the meal with the carpaccio di manzo, sliced raw beef tenderloin over a bed of arugula and topped with shaved parmesan. Voted Readers’ Choice for best carbs in Maryland in USA Today, Delaware Today, and more, The Wellwood Club serves delicious seafood in a casual setting. They serve crabs all year long. Try it for yourself with the crab and cheese waffle fry appetizer. A 2018 Diners’ Choice Award winner from Open Table, Pine Lodge Steakhouse on Deep Creek Lake serves lunch, dinner, and drinks. Whether you’re in the mood for a full steak dinner or just want a taste of the ocean, the lobster boat appetizer is a must-order. The smoke roasted jalapeno poppers served at the Founders Tavern Grille in Pasadena will keep you coming back. These large stuffed jalapenos are served with asiago, sharp cheddar, cream cheese, chorizo sausage, and ranch dressing. In other words? Heaven in a jalapeno. The Prince Edward Island mussels served at Edgewater Restaurant in Edgewater, Maryland, are, in a word, divine. Served with fresh Pomodoro, roasted garlic, herbs and white wine, they’re worth making a trip by themselves. If that wasn’t enough, the rest of their appetizer menu is filled with even more exquisite dishes, like the pistachio gnocchetti. The Robert Morris Inn is the oldest full-service inn in America. Visitors will enjoy “stunning water views, wonderful food from our kitchens and roaring fires in our taverns,” according to their website. The menus change seasonally, but the quality never goes down. For fall, we recommend the butternut squash soup with smoked bacon and cinnamon whipped cream. Fiorella in Oxon Hill, Maryland is a casual Italian eatery with pizza, pasta, and delicious appetizers like the fried house made mozzarella balls. You read that right. How could anyone say no to fried mozzarella balls?